From concept to completion, our experienced engineers and machinists can produce precision components per exact specifications. Utilizing the latest in machining / software technologies, we can design your parts from conceptualization to ensure high-precision molds with tight tolerances. Our mold design & engineering process includes an in-depth review which can result in a better material selection and a reduction in cycle time. 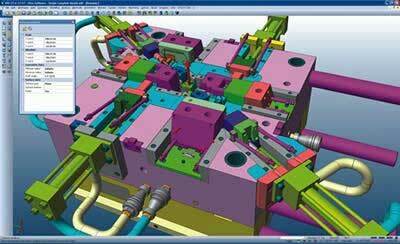 All mold layouts are designed in 3-D format to ensure compatibility to press, projected cycles, and designated tool standards. We can offer design improvements and make recommendations that can eliminate potential problems, reduce cost and improve end-user experience. Large capacity tool and die capabilities. We handle detail work from build to print or 3D CAM Data for both prototype and production runs. We can help in designing your most complex parts using the latest software. We help in identifying problems at the design level to make the production cycles run quicker and much smoother. Our Designers help to turn ideas into reality faster and deliver results the right way the first time.